On the other hand, if you need to replace a large area or the drywall on the whole wall, then you may want to enlist the services of a licensed and insured professional. Jobs done by certified professionals such as us are warranted and are supervised by the owners and managers from beginning to end. With over 25 years of experience in Construction and Plumbing and our portfolio of satisfied clients, we are able to take on any remodel project, large or small, including replacing or fixing sheetrock or drywall in your home or office. Sheetrock is also used to lower or replace ceilings in office buildings. If you are remodeling your office, we can tackle that part of the project too without your having to call an additional company. We love what we do and are delighted to be able to offer you a one-stop-shop experience when it comes to any construction and remodel job. The reason that sheetrock or drywall is used commonly is because it is less expensive than wood paneling and, because of its thickness, it provides good insulation. Also, sheetrock may be cut and painted easily. These are major advantages in comparison with the disadvantages that are precisely the fact that sheetrock is not as durable as some other materials used for walls and ceilings. Installing sheetrock is best done by a professional, since it needs to be handled with care as it may crack easily and it doesn´t handle moisture well. There is an upside to this though, which is that drywall can also be repaired easily and with minimal if any traces of the repair once it has been repainted. 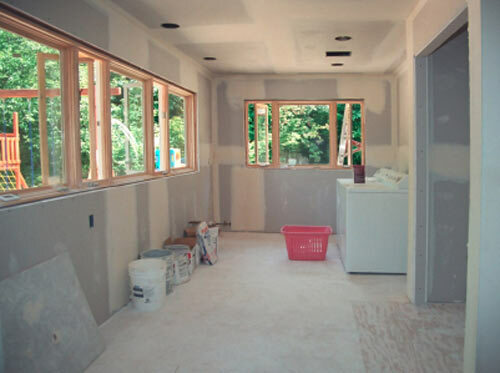 No matter what the nature of your remodel, know that we are able to repair or replace the sheetrock and drywall in your home or office too.